Everyone is exposed to different environmental influences in their day-to-day lives. For example, in an average workplace illuminance, sound level, and indoor air quality are all significant factors that influence people's performance and well-being. Testo offers suitable measuring instruments for controlling each of the measurement parameters of lux, sound, and CO2 (for indoor air quality). 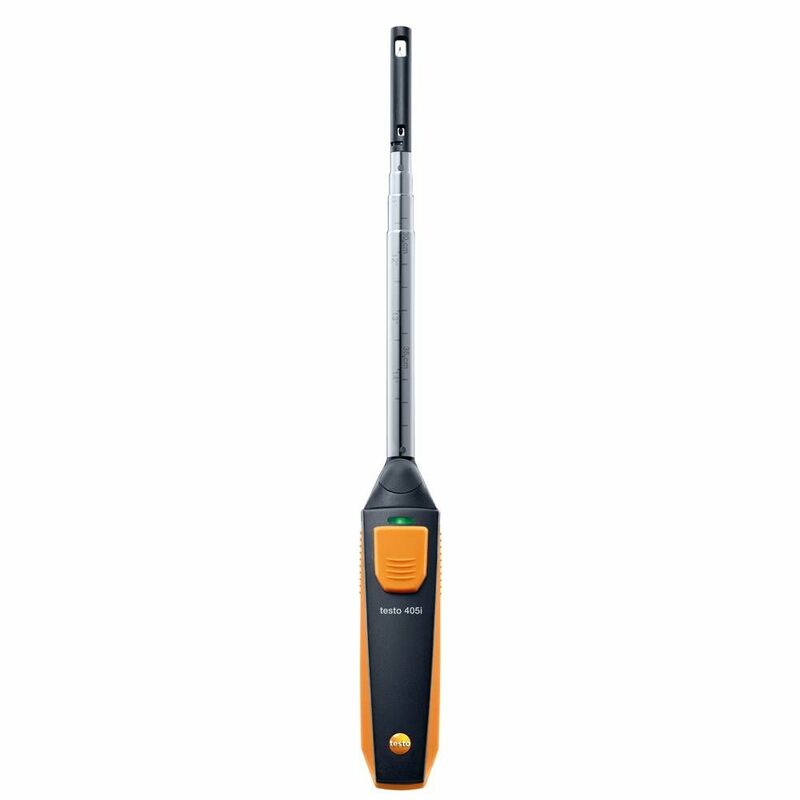 The testo 405i Smart Probe is a wireless instrument for measuring air flow velocity, temperature, and volume flow. It is equipped with a telescopic shaft, which extends to 15” for easy in-duct testing. You can reliably determine timed and multipoint flow traverses. 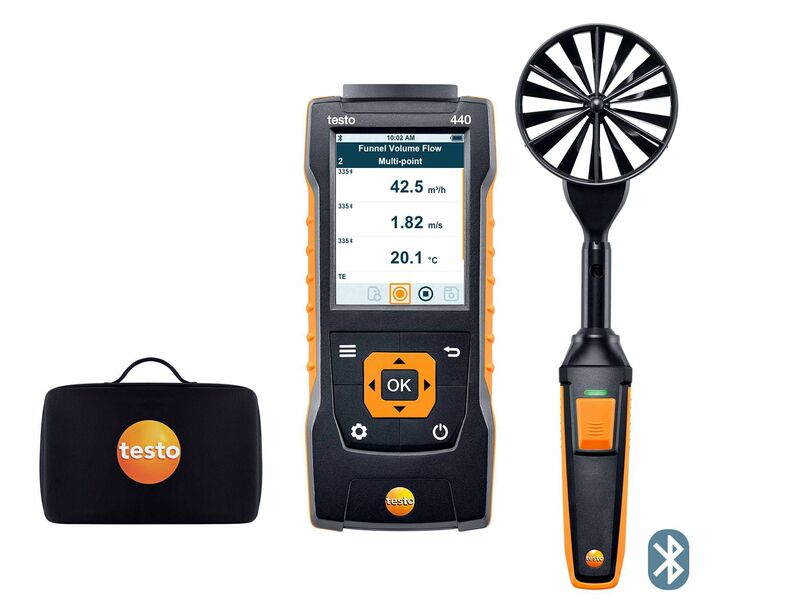 This testo 440 kit is great for carrying out measurements in ventilation ducts. 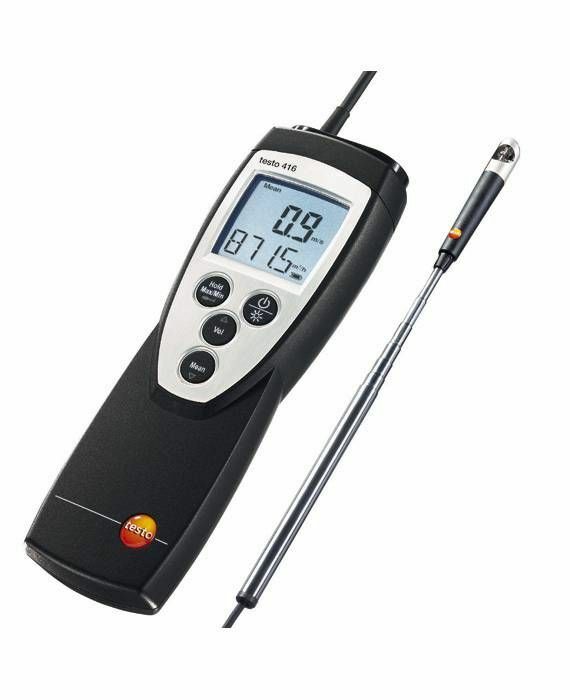 The testo 440 air velocity and IAQ measuring instrument and its hot wire probe (Ø 0.35") with temperature sensor can all be safely stored in the included case. 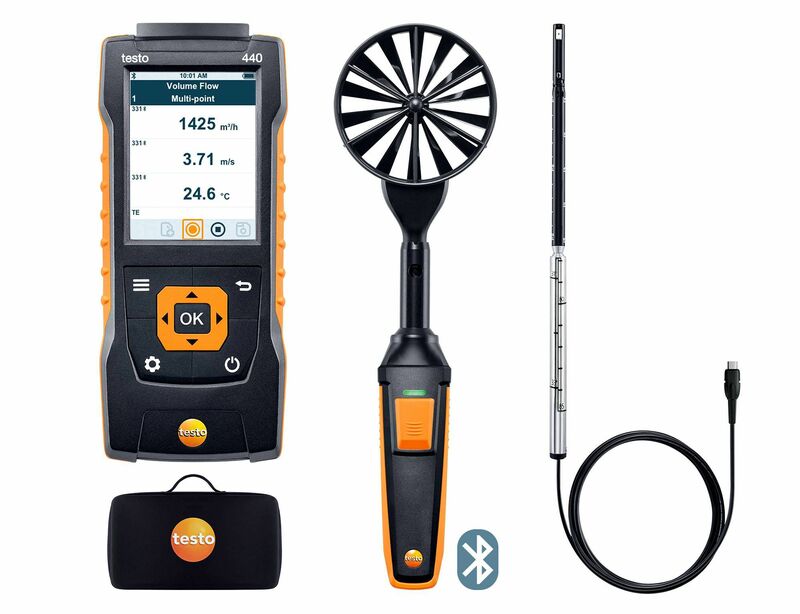 This testo 440 kit is great for carrying out measurements in ventilation ducts. The testo 440 air velocity and IAQ measuring instrument and its vane probe (Ø 0.63") can all be safely stored in the included case. 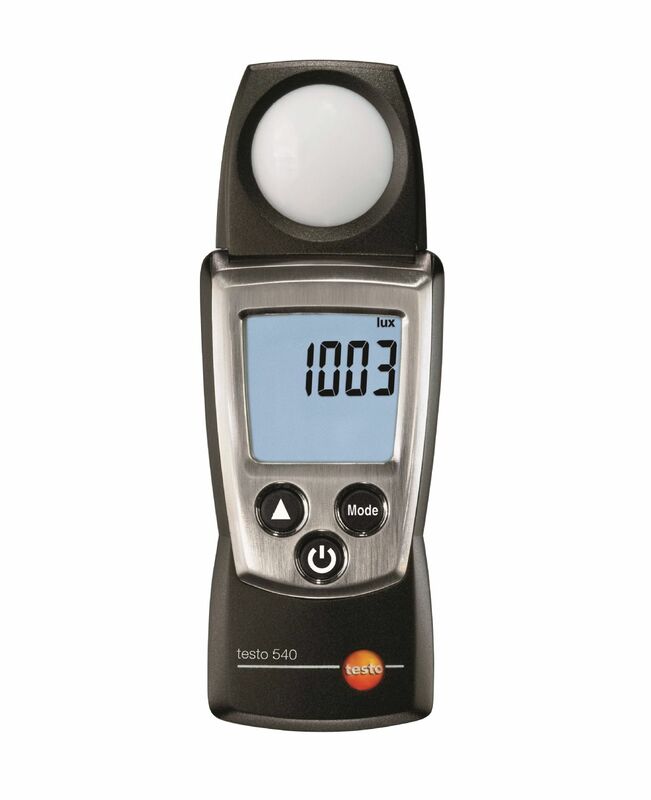 Use the testo 405 thermal anemometer to measure air velocity, volumetric flow, and air temperature. It is suitable for carrying out quick check measurements in ventilation ducts, and for measuring the air velocity in rooms, such as at drafty windows. This testo 440 kit is great for carrying out measurements at air outlets. 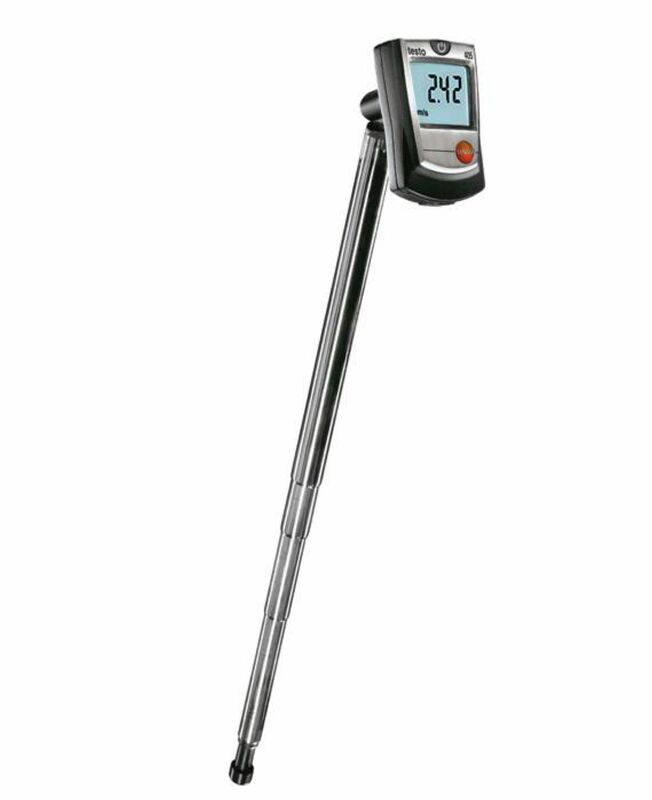 The testo 440 air velocity and IAQ measuring instrument and its vane probe (Ø 3.9") with temperature sensor can all be safely stored in the included case. 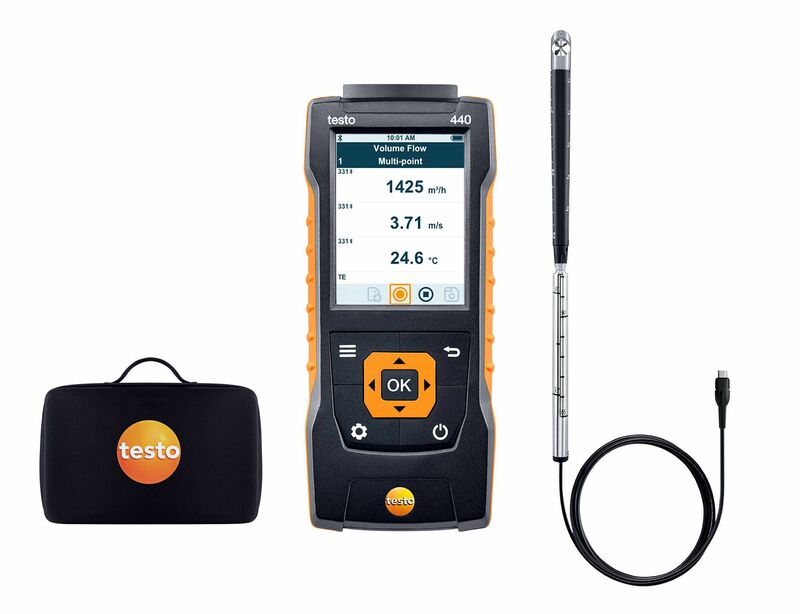 This testo 440 kit is great for carrying out indoor air quality measurements. The testo 440 air velocity and IAQ measuring instrument and its CO2 probe with humidity/temperature sensor can all be safely stored in the included case. This testo 440 kit is great for carrying out measurements in ventilation ducts and at air outlets. 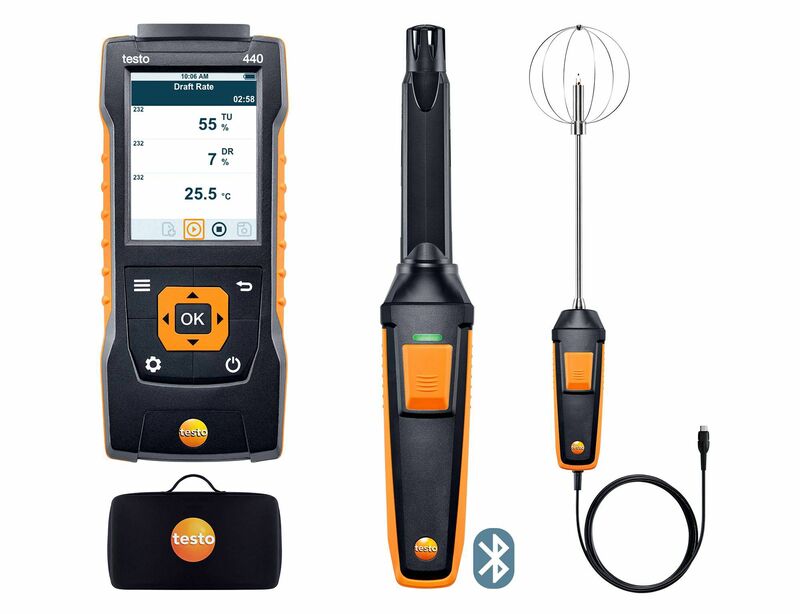 The testo 440 air velocity and IAQ measuring instrument, its vane probe (Ø 3.9") with Bluetooth and temperature sensor, and hot wire probe including temperature sensor can all be safely stored in the included case. This testo 440 kit is great for carrying out measurements in ventilation ducts and at air outlets. The testo 440 air velocity and IAQ measuring instrument and its vane probes can all be safely stored in the included case. 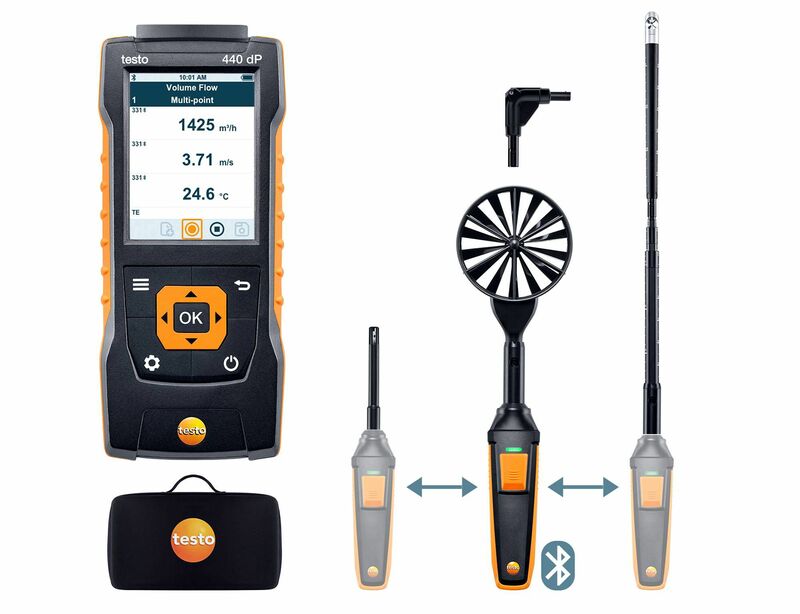 This testo 440 kit is great for evaluating indoor air quality and determining draft risk and degree of turbulence in workplaces. The testo 440 air velocity and IAQ measuring instrument and its CO2 probe with humidity/temperature sensor and turbulence probe can all be safely stored in the included case. 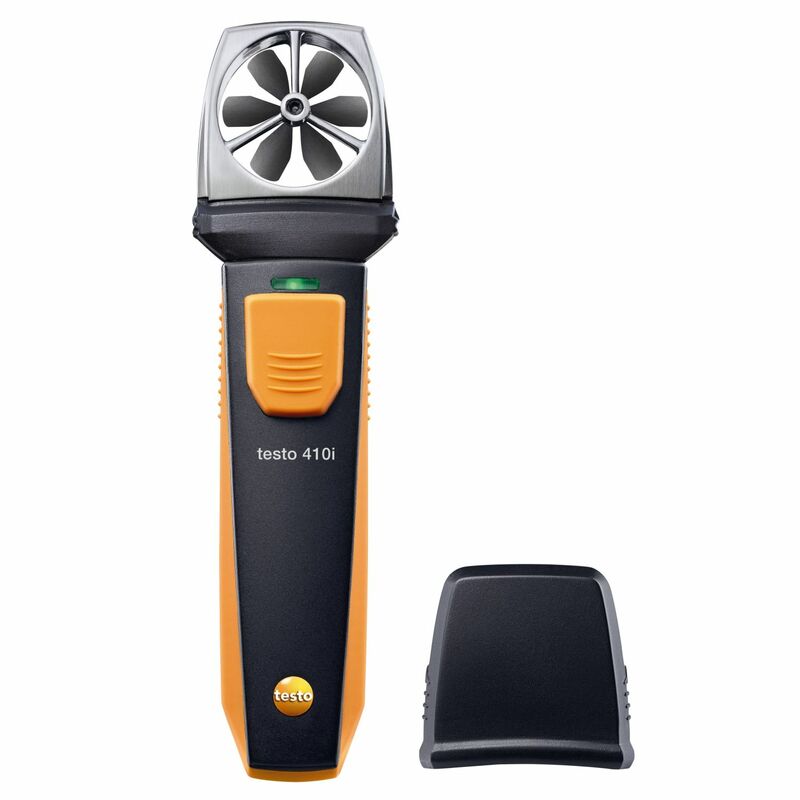 The testo 416 small vane anemometer (air flow meter) accurately and easily measures air velocity and volume flow (CFM) for in-duct and a variety of HVAC applications above 120 fpm. As vane technology is inherently air density independent, the testo 416 handheld digital vane anemometer provides repeatable and reliable readings test after test. 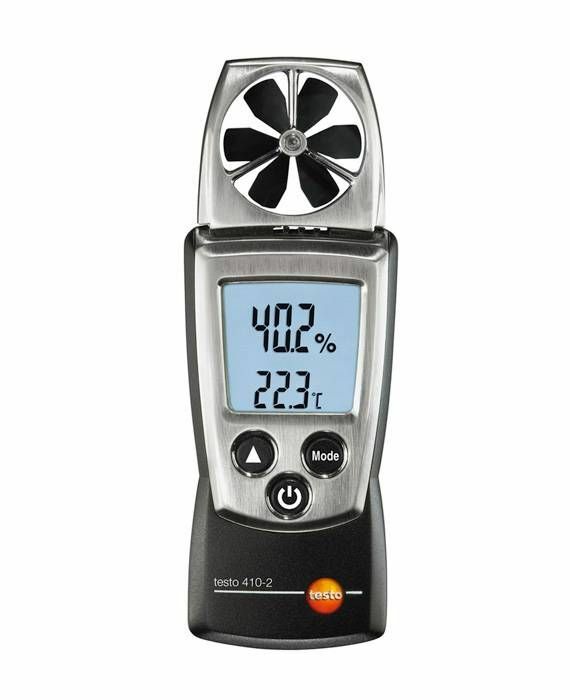 The testo 410-2 handheld anemometer with humidity measures air flow, air temperature, and humidity quickly, easily, and accurately. 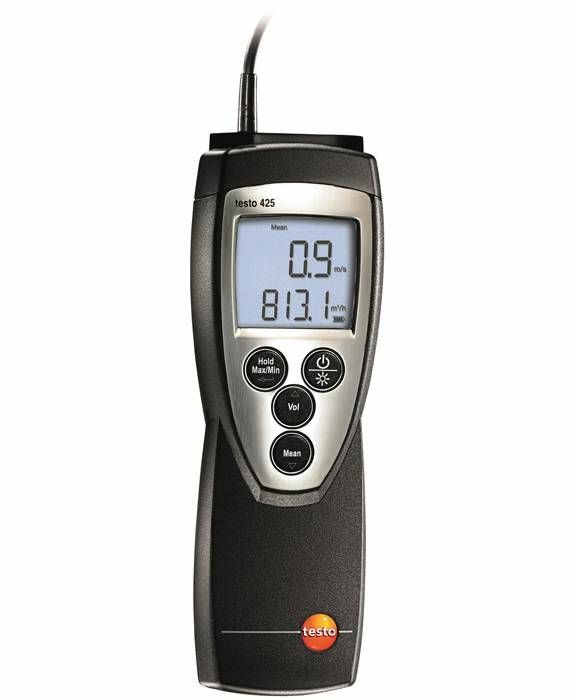 The compact testo 410-2 air and humidity meter is ideal for fast comfort spot checks and timed averaging calculation. 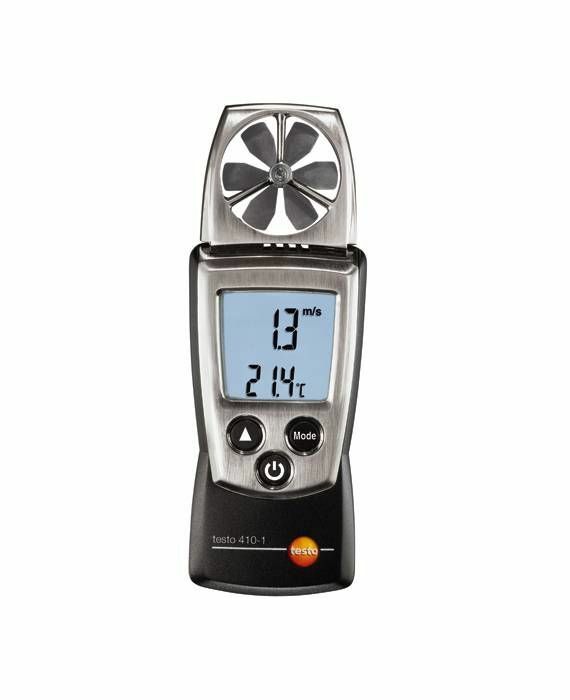 The testo 410-1 pocket anemometer measures air flow and air temperature quickly, easily, and accurately. The integrated 1.5 inch vane makes this economical air flow instrument ideal for fast air velocity measurement spot checks. 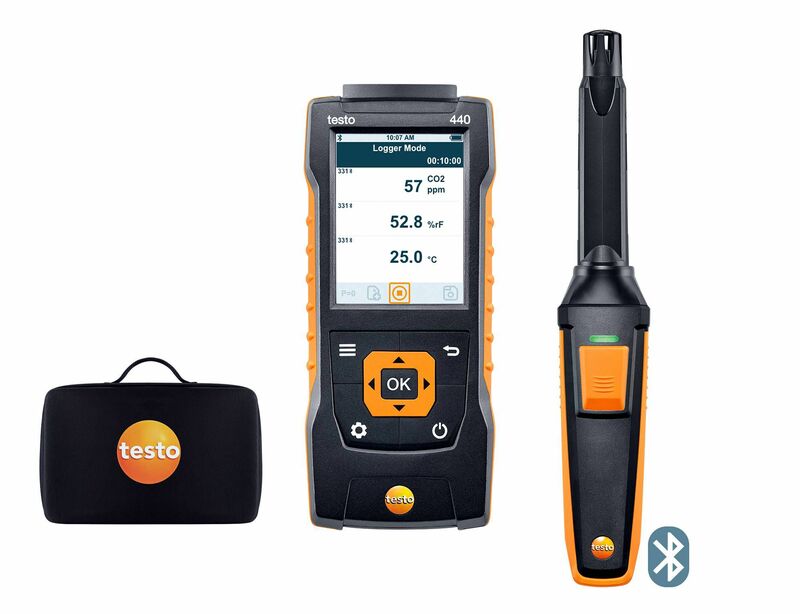 The testo 435-4 multifunction meter is perfect for monitoring, analyzing, and diagnosing indoor air quality, wherever you need to take important IAQ measurements. In addition, you can easily pinpoint and troubleshoot problems with HVAC systems, and immediately see the results of corrections. 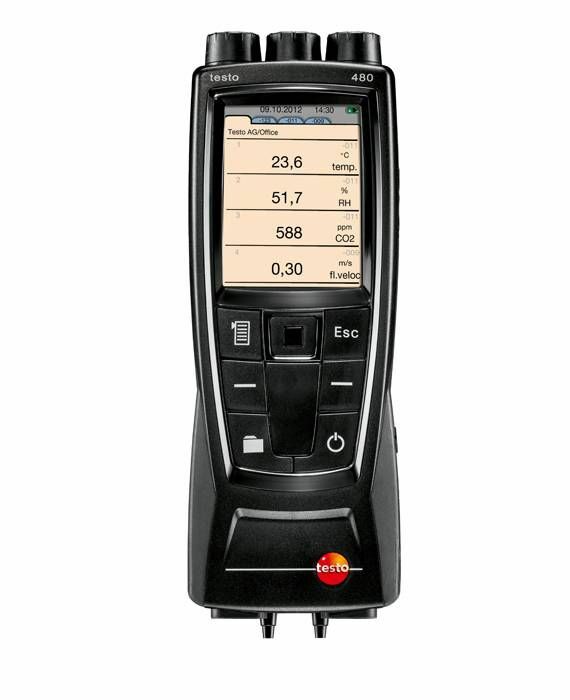 Commissioning, validating, benchmarking, or simpy adjusting HVAC systems are all easy with the testo 435-4. 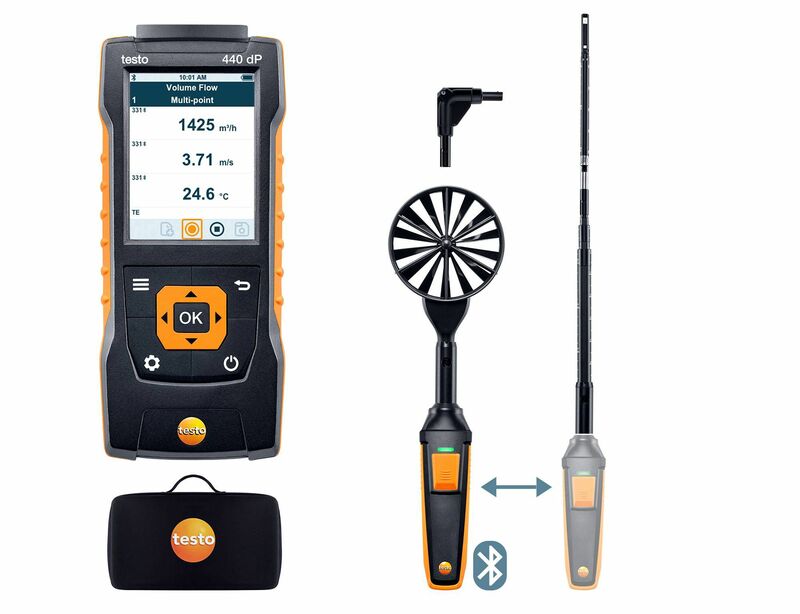 The testo 410i Smart Probe is a compact wireless vane anemometer for measuring air velocity, temperature, and deriving volume flow. It can be used at air outlets, and for monitoring the air flow of ventilation systems.